Happy Harry’s is proud to announce the release of Barrell Craft Spirits in North Dakota. Happy Harry’s will be the exclusive retailer in North Dakota on the initial launch of these amazing products. Barrell Craft Spirits, based in Louisville, Kentucky, is an independent blender and bottler of unique aged, cask-strength sourced whiskey and rum spirits. They conceive of, design, launch, and talk about Spirits with a focus on what people want now and not what has been successful in the past. This affords them access to some of the most interesting and delicious spirits in the world. 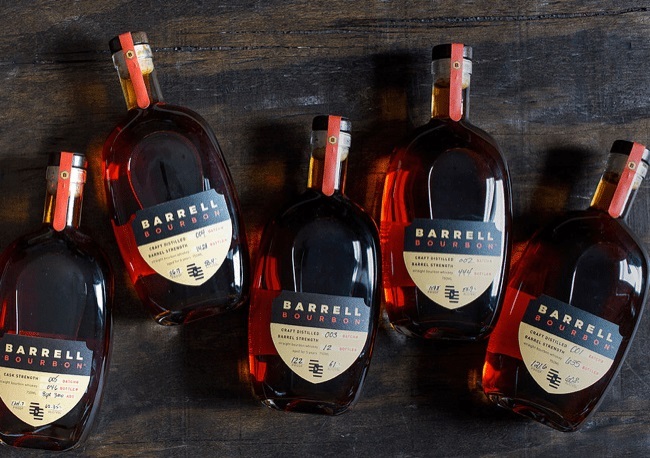 Barrell Craft Spirits goal is to blend products that explore different distillation methods, barrels and aging environments, and bottle them at cask strength. Every batch is produced as a limited release and has an intentionally distinct flavor profile. Batch 17 is Bourbon Whiskey that was distilled and aged in Tennessee, Indiana and Kentucky. This selection is a blend of 10 year – 4 month, 14 and 15-year-old barrels, crafted and bottled in Kentucky at 112.5 proof cask strength. Mash Bill: corn, rye and malted barley. TASTING NOTES: An autumnal nose of mulled cider and cherry pie leads to an unexpectedly complex and tropical palate. Steely minerality lends tension to a whiskey that is at once rich and delicate. Batch 15 is a Bourbon Whiskey distilled and aged in Tennessee and Kentucky. This selection is comprised of selection of 9.5, 10 and 11-year-old barrels. Crafted in Kentucky and bottled in Kentucky at 107.6 proof cask strength. Mash bill: corn, rye and malted barley. ​AWARDS: Ultimate Spirits Challenge – 90 points. San Francisco World Spirits Competition – Gold Medal. Whisky Advocate – 90 points. TASTING NOTES: Creamy exotic filberts, trails of tart Granny Smith apple skin, lush saddle leather and minute bursts of campfire charred gingerbread abound in each sip. Light swirls of the wrist offer touches of nutmeg and cardamom. ​AWARDS: Ultimate Spirits Challenge Finalist, and 95 Points. San Francisco World Spirits Competition – Gold Medal. TASTING NOTES: Thick slabs of smoked bacon, tiny curls of cedar wood shavings, bitter chocolate pastilles and Georgia peach preserves wash over the palate in rapid succession. Subtle notes of open fire cooked corn bread dusted in zesty chili powder give way to crumbles of dehydrated oranges. Hints of salty crushed minerals and rich lemon curd round out this bourbon. Tale of Two Islands is a Jamaican pot still rum, distilled and aged in Jamaica for 8 years. Finished in Islay whisky casks and bottled at 132.8 proof cask strength. TASTING NOTES: With bright tropical notes, dark molasses undertones, and a mysterious hint of peat and smoke, Barrell Tale of Two Islands Rum is intense and deeply layered. With separate distillation, aging, and finishing influences from Jamaica, Kentucky and Islay, this is a truly unique and limited Spirit. TASTING NOTES: Luxuriant Sherry-soaked graham cracker crust peach cobbler leaps onto the tongue and immediately leads to mustardy slices of crusty rye bread. It continues with flavors of caramelized brown butter and warm vanilla custard accompanied by broiled grapefruit. The 123.8 Proof is unmistakable yet rich, soothing, and understated. The tradition of keeping an infinity bottle is well known to whiskey collectors and aficionados around the world. Take the last ounces of each whisk(e)y bottle as you finish it, and pour them into a bottle you’ve set aside. Barrell’s Infinite Barrel Project does the same thing, but on a much larger scale. They remove a portion of whiskey and replace it with other barrels that will complement the remaining blend. They then repeat the process – bottling a portion and adding newly selected whiskeys each time. The July 16, 2018 Infinite Barrel release is certainly a mixed bag of whiskies that include the following: Western Highlands Scotch Whisky, Tennessee Bourbon, Tennessee Rye and Indiana Rye. To celebrate the New Year, they create a new Barrell Bourbon New Year Limited Edition. It’s comprised of reserves from some of their batches and other choice barrels coming from 6 distilleries in 6 states. Throughout the year they set aside particularly inspiring barrels that they believe will make an interesting contribution to the New Year release. The 2019 release is a selection of 5, 8, 11, 14 and 15-year old straight bourbon whiskeys that were distilled in Tennessee, Kentucky, Indiana, New York, Texas and Illinois. The 2019 release was crafted and bottled in Kentucky at 112.1 proof cask strength. TASTING NOTES: The nose is greeted by a fully laden dessert cart, resplendent with assorted dried fruits and nuts, chocolates, and other confections. On the palate, rye grain delivers a complex and harmonious blends of herbs and spices. Rye Batch #2 is the second release that expands on Barrell’s interpretation of a traditional rye whiskey, combining two very diverse ryes. They selected barrels of a 100% malted rye distilled and aged in Poland for 5 years in new charred #3 oak barrels from World Cooperage. We then blended it with an Indiana high malted barley rye that was aged in Indiana and Kentucky for over 5 years. This complex 15-year-old bourbon was blended and bottled at peak maturity so you can experience its true flavor. It is a perfect union of grain and barrel, with an old, oaky nose and a deep, honey- maple palate that reveals the lushness of the grain. Named by Fred Minnick as Best American Whiskey 2018! If you are curious who Barrell beat out at second place…it was juggernaut William LaRue Weller! Distilled and aged in Tennessee, Kentucky and Indiana. Crafted and Bottled in Kentucky at 105.1 cask strength. Mash bill: corn, rye and malted barley. TASTING NOTES: After hitting the palate like a shock wave of flavor, the notes reappear with grace and nuance. Flavor comes in bold and elegant waves. This complex beast – just a flat-out butterscotch bomb – would rival any whiskey in the world. AWARDS: Forbes Magazine – Best American Whiskey of 2018, by Fred Minnick.